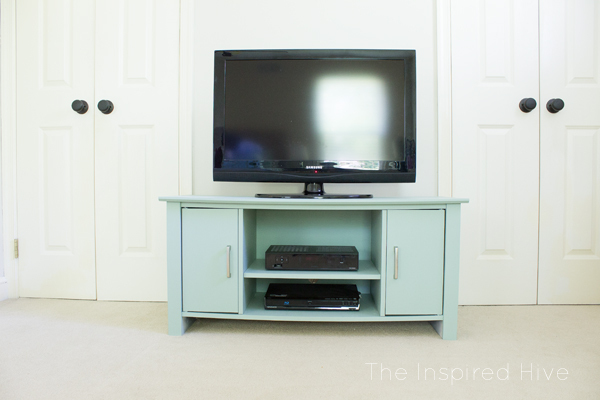 The story of how an old Thomasville dresser was turned into a TV stand. 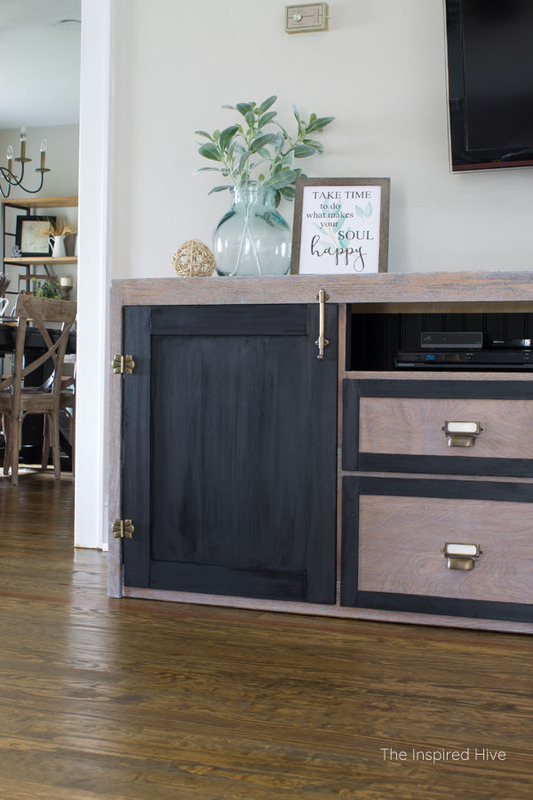 Have you ever owned a piece of furniture that speaks to you? It tells you a story of its past, present, and future? 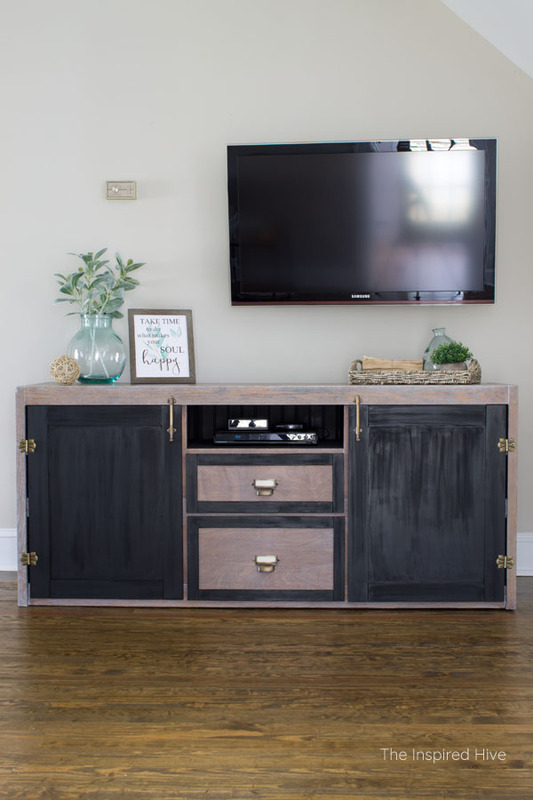 It's easy to go to the store and buy a piece of furniture that meets your needs. But sometimes the perfect piece has been there all along just waiting for you to listen to it and give it a little love. Today I'm sharing the journey of a piece of furniture that inspired me many years ago and has evolved with me along the way. 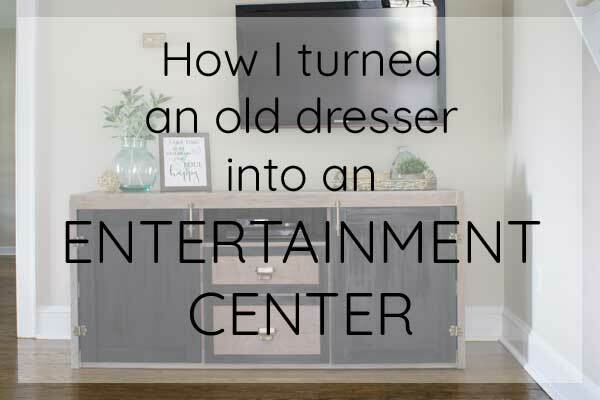 I don't pretend to be an expert in furniture makeovers, and every step of this transformation was a huge learning process. 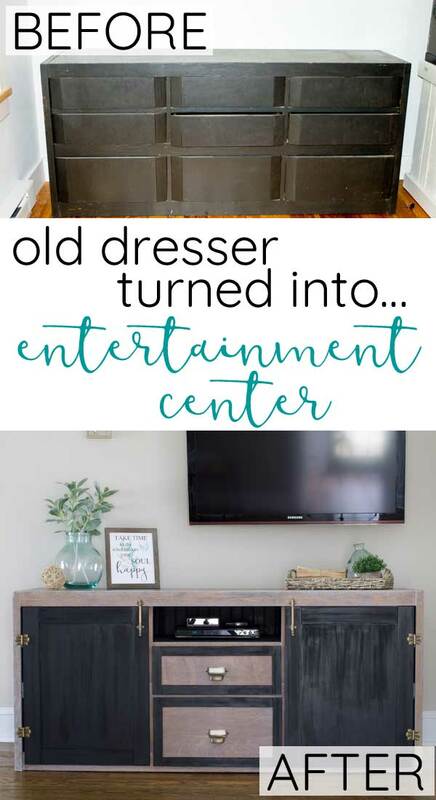 So this isn't so much of a step by step tutorial as it is a story of its transformation from neglected old dresser to modern farmhouse media cabinet. This new statement piece in our living room reminds me of my childhood, my first years as an independent young adult, and my journey to find balance in motherhood. Who knew a piece of furniture could do all of that? Product for this post was provided by House of Antique Hardware. All opinions are my own. For more information, see my disclosure policy. The entire reason I bought this piece of furniture when I was twenty-one years old stems way back to when I was a little girl. At the age of four or five years old we went on a camping trip to Yogi Bear's Jellystone Park with some relatives in Louisiana. I've done a lot of camping in my life, but that is a trip I will never forget because it was the beginning of my love of my favorite animal. I'll never ever forget the feeling of being a tiny little girl peering over that bridge railing, looking down at what seemed like hundreds of little baby turtles swimming in the water below. I'm sure my memory of how many there were is a bit exaggerated, but I sure was captivated by those cute little guys. I was obsessed and kept wanting to go back to look at them. My parents ended up letting me take one home. And so it began. I had a lot of pet turtles over the years. I found them fascinating. I think because they are a lot like me. They are introverted. 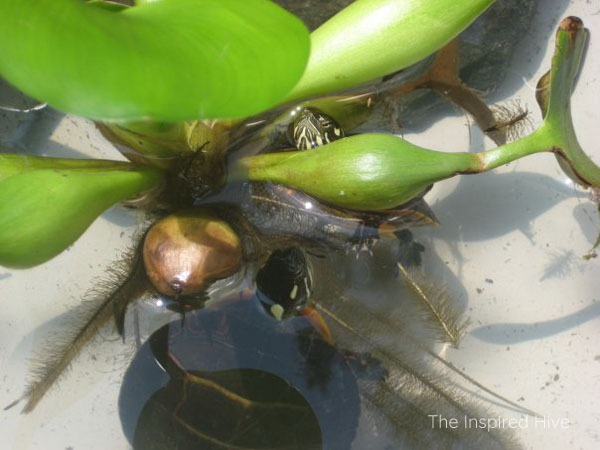 They can be really shy at first and will quickly withdraw into their shells. But if you're willing to stick around, they get to know you, trust you, and allow you to see their true personalities. One summer afternoon in college, my roommate and I went to a local park. We were outdoorsy girls, so we went there fairly often and had recently seen some turtles. We were determined to catch some. 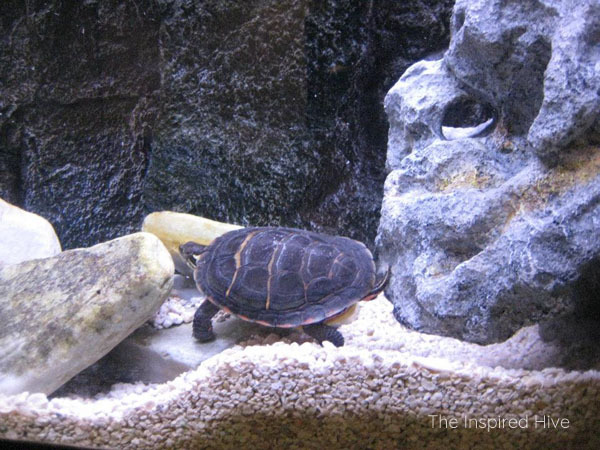 You've probably never tried to catch a turtle in the water... it's not easy. It took a lot of time and a lot of mess! We ended up going home covered in mud with two turtles to call ours and set them up in a Rubbermaid bin full of water on the back porch with plants and mosquito fish. That set up was all we could afford at the time. They actually thrived in that tub. They basked in the sun all day every day and I wished I could relax like that. Eventually, the weather turned cooler and it was time to move them indoors. 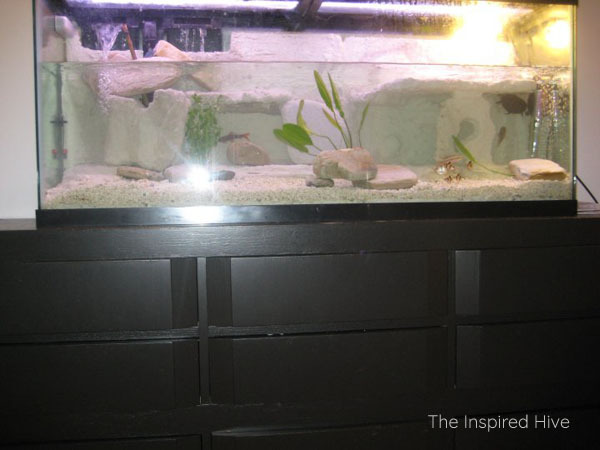 Initially we kept them in a small aquarium in our living room while I searched for the perfect solution. House guests loved watching them swim around. I didn't have a lot of money in my college days, so I searched Craigslist every day for a used tank to put them in. 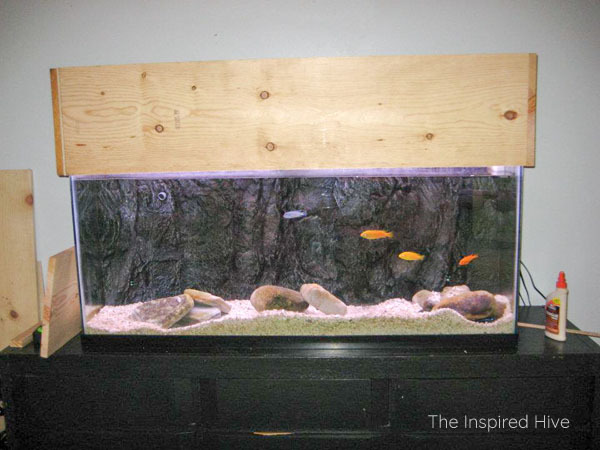 I eventually found an old 55 gallon aquarium and iron stand and moved it to my bedroom. There I got even more enjoyment out of it. I put my desk in front of it and sat there to study. 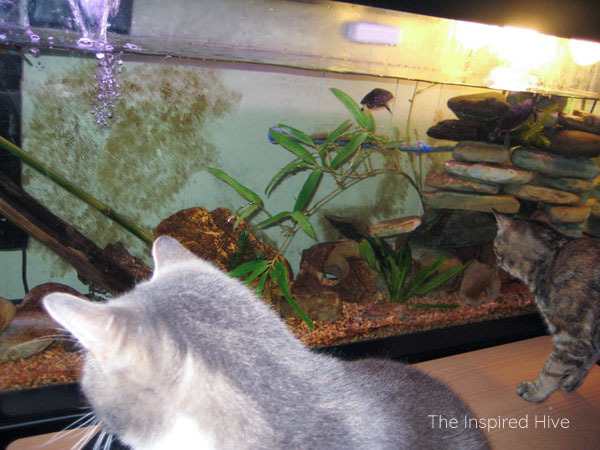 My two cats would also sit and watch the turtles for hours. 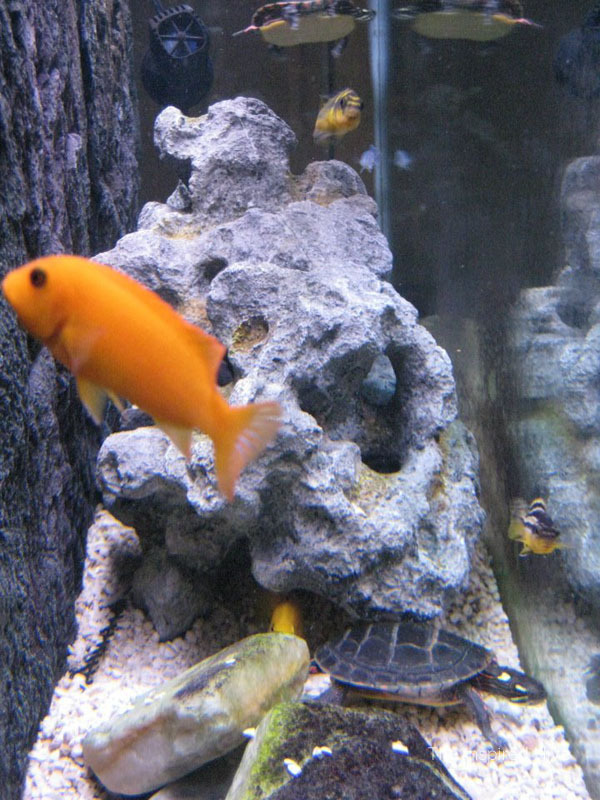 At some point, I added some cichlids to the tank which added to the beauty and entertainment. I loved having a bit of nature in my room. When I graduated and moved out on my own, I wanted to bring the turtles to my new apartment. By then, I had also started to truly embrace my passion for home decor and that old iron stand just wasn't going to do. I started hunting for the perfect piece to hold that heavy four-foot-long aquarium. My mom and I were out one day and saw a yard sale on the side of the road. I found this old Thomasville dresser and bought it for $35! I hauled it three hours to my new apartment. 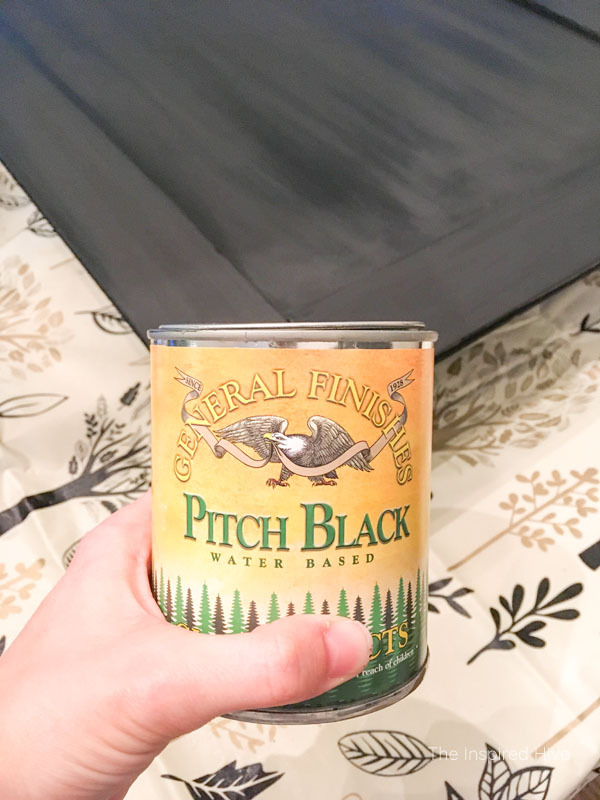 At the time, I had very modern taste, and most of my decor was black and silver, so I painted it black. I somehow managed to move that tank from the iron stand to the dresser all by myself. I created a beautiful background for it using styrofoam and concrete. Later, I upgraded the tank background and my boyfriend helped me build a large wooden canopy to hold the UV light for the turtles. It took a lot of time and effort, but before I knew it, I had a beautiful, modern looking focal piece in my little apartment. That black dresser and big aquarium made two more moves over the years (and multiplied into several more aquariums of fish...) and the turtles eventually made their way back outside into my backyard pond. The boyfriend became the husband, and the black dresser was no longer our style anymore, but I couldn't bear to part with it. I convinced my husband to let me keep it in the garage until I knew what to do with it. 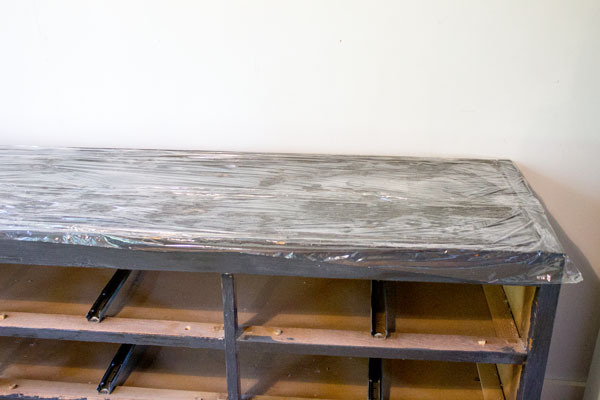 It collected dust, filled with tools, and was frequently used as a work bench. When it came time to move into this old farmhouse, we got rid of a lot of stuff. I got rid of several other pieces I had painted over the years, and again my husband urged me to part with this dresser. I insisted on keeping it, and so we hauled it three hours back to where it originally came from and it went straight into our storage shed. I still had no idea what, if anything, I would use it for. But then our toddler started getting braver and more mobile. He was climbing everything. Including our five foot tall entertainment center. I was so worried he was going to pull it onto himself. 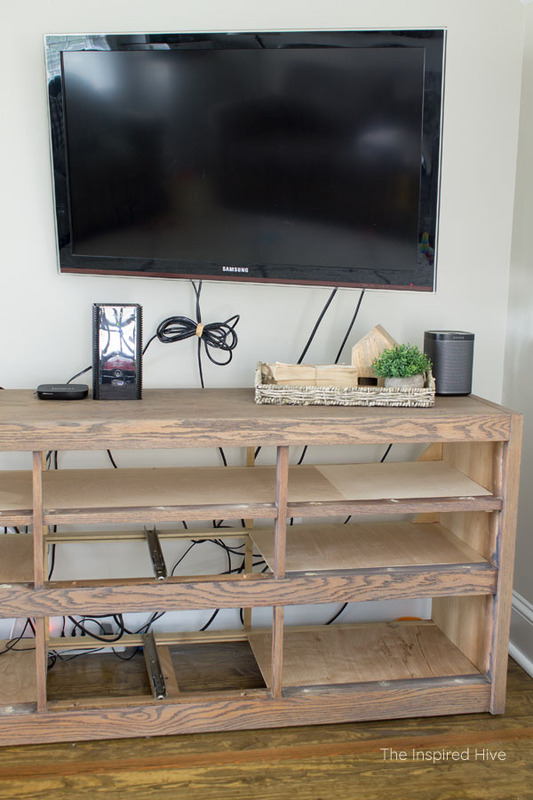 We needed a new TV solution ASAP! We had been meaning to buy a new one sometime anyway because that old Ikea unit was also no longer our style either. 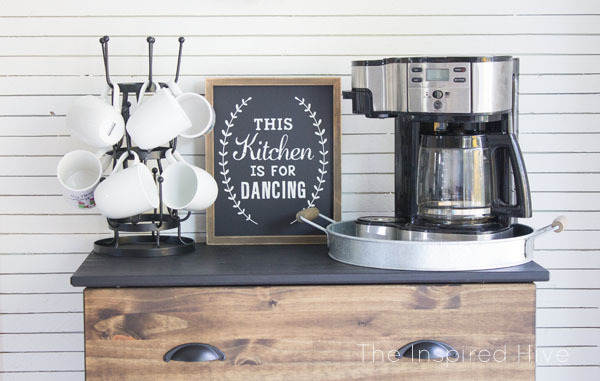 We started browsing around, and I really loved this one but then it clicked... what about that old dresser? 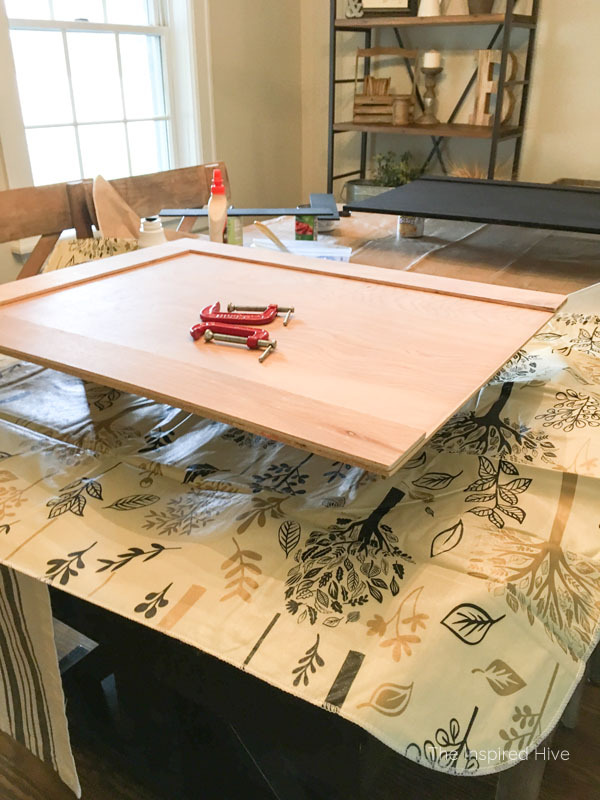 And so last fall, while we were stuck sleeping in the guest house on our property for four days while we were having our hardwood floors refinished in the house, I decided to get to work. I had nothing else to do but feed the baby. There was no TV or internet out there. So why not get creative? So while my husband wrangled the kiddos, I stripped the dresser then and there. I had done plenty of furniture painting in the past, but never had to completely strip anything, especially nothing so large. I had no idea how much work it would be! I used Citri-strip and found that covering it with plastic wrap made it more effective. I scraped the paint away after 30 minutes or so. Then I wiped it down with mineral spirits to remove all traces of Citri-strip. Then my husband and I hauled it out to the yard and sanded it. And sanded and sanded and sanded. 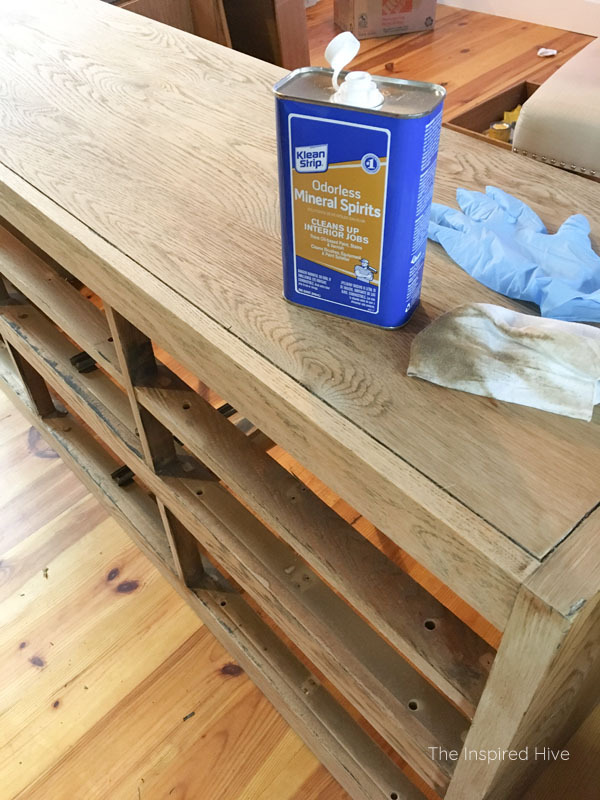 I was hoping to stain it, so we got it as clean as we could. Then we removed all of the drawers, tracks, backing, etc. I left the two bottom middle drawers but removed their faces. 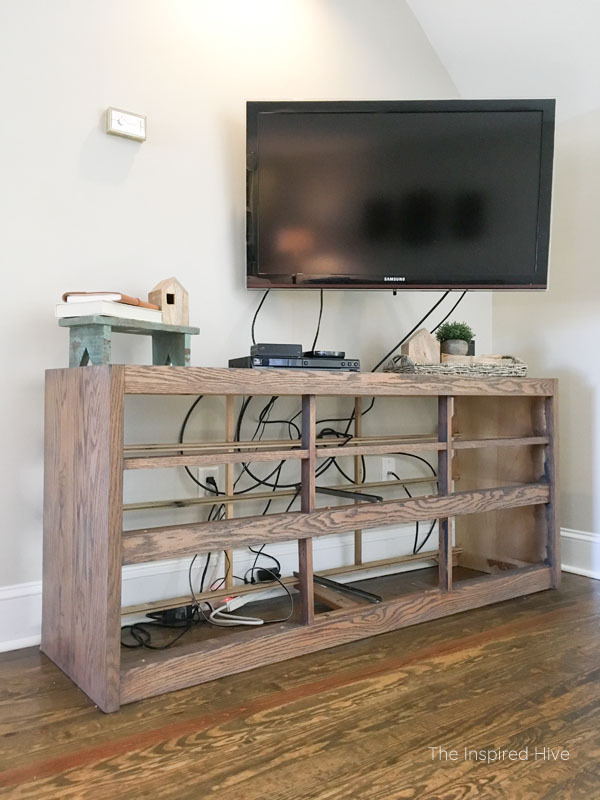 I planned to make the top middle into a shelf for the DVD player, cable box, etc. I had no idea what the rest of my plan was at the time. Then it was time to stain it. I wiped it down with mineral spirits again to remove all of the dirt, sanding dust, and any leftover finish or Citristrip. I used a mixture of Minwax Weathered Oak and Special Walnut hoping to get it similar to our new floors. I had hoped to put a coat of a darker stain over top, but the toddler became even braver so we scurried to get it inside without doing any more work. Crisis averted. And there it sat. For months. No drawers. No shelves. Cords everywhere. Ugh. But at least the toddler couldn't pull it on himself. Have you ever tried to complete a project with a toddler and a baby? Basically, it doesn't happen. Until it has to happen. Like when the baby learns to crawl and climbs into the open dresser and plays with the cords... Oh noooo! Time to get back to work. The good thing about it sitting in our living room unfinished for so long is that I got to know our house better and was able to develop a better vision of what I wanted the piece to look like. I had the entire thing designed in my head. I wanted it to look aged and weathered, so I ordered some liming wax. Another first. I watched a few videos and thought I could handle it. It turned out great on the long skinny pieces. But the sides are a bit of a mess. If I ever try liming wax again, I will use a brush instead of a cloth and work in full sections at a time instead of small sections. I also learned that using clear wax can help remove some of the liming wax, so that helped a lot. The piece was almost white before using clear wax. I think on a different piece it would work better, but the grain on the veneer wasn't very deep, so the liming wax didn't have much to fill in. Next, we built doors out of plywood. I knew I wanted two doors on either side to store movies, kids' books, games, etc. I wanted them to be shaker style to match the rest of the cabinetry in the house. 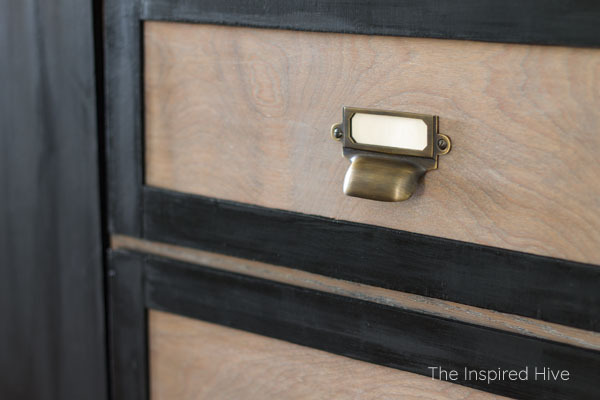 I thought I wanted to paint them black, or maybe a distressed white, or maybe an aged mint color... but then I saw these gorgeous nightstands and I knew the answer. I was no longer afraid to choose a dark color. Then I coated them with a black glaze to give them that aged finish I was hoping for. I had never worked with glaze before either. I quickly learned to do an entire section at once, to work quickly, and to wipe away the glaze in long strokes down the entire section. 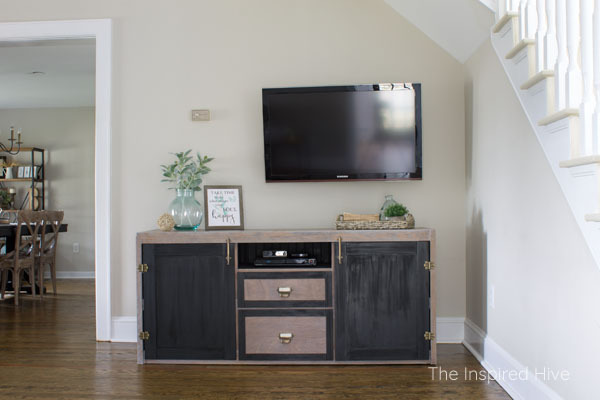 See that beautiful rustic finish in the background?? Then the drawers. I also wanted these to be shaker style, but I was worried about having too much black. I decided to stain the center of the drawers. I tried to match as closely as possible to the stained veneer. It was tricky because it was real wood and a different type of wood altogether, but I think it came out pretty close. I used the liming wax here as well. Then we painted and glazed the trim and attached with wood glue. We added shelves with plywood using 1x2s as supports. And then I painted them black. 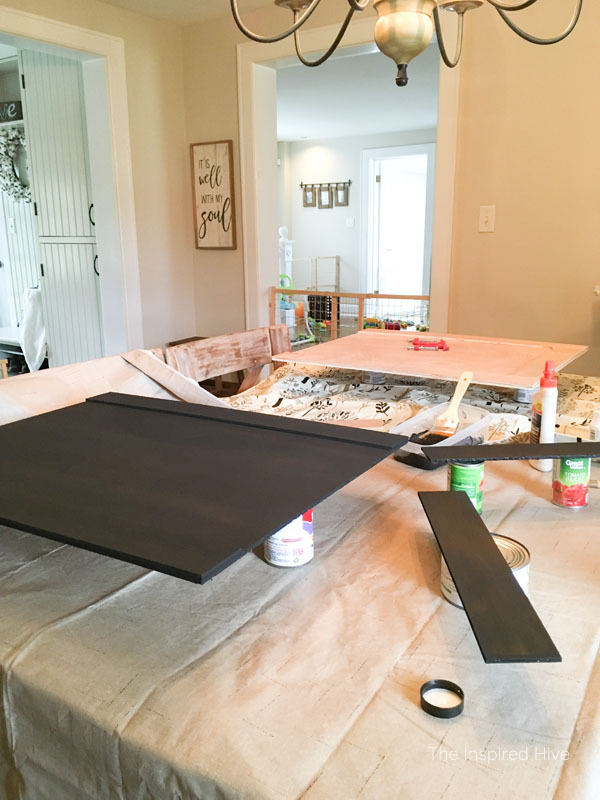 And I forgot to take a picture, but we nailed painted beadboard to the back to keep things from falling out. I don't normally like brass, but as I've gotten to know this old house better, I've started to fall in love with it. I've added it here and there and think it complements the age and charm of this farmhouse perfectly. On this particular piece, it adds contrast and dates the piece even more. 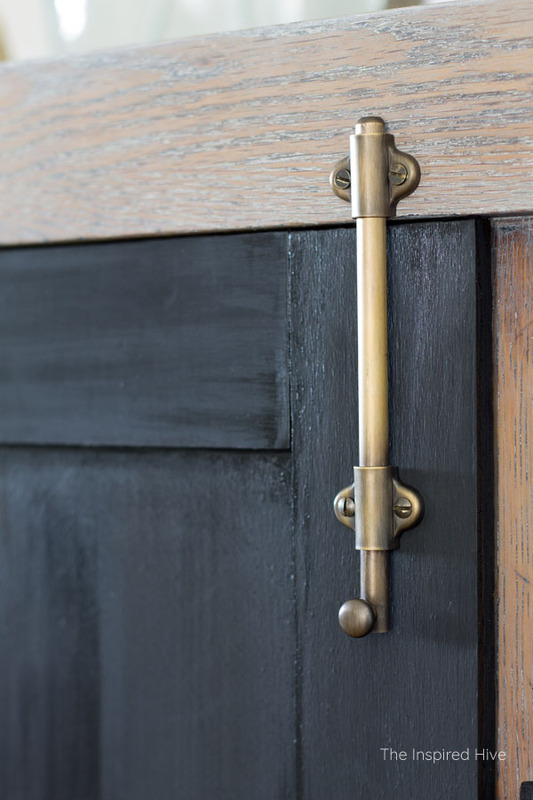 The detailing on the hinges adds to the antique vibe and pulls the whole look together. 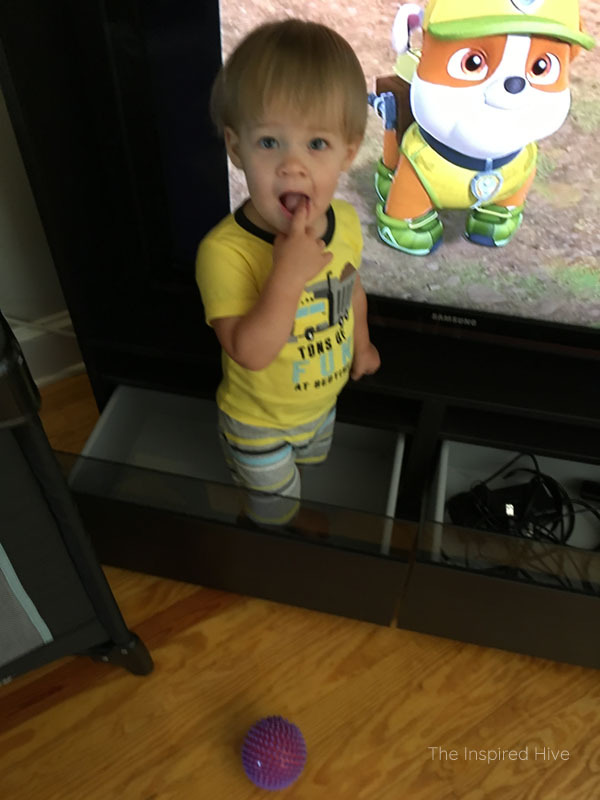 We attached the drawer fronts to the drawers using wood glue. And then we added these beautiful label holder pulls. I'll add labels for whatever ends up in these drawers. Probably movies and games! 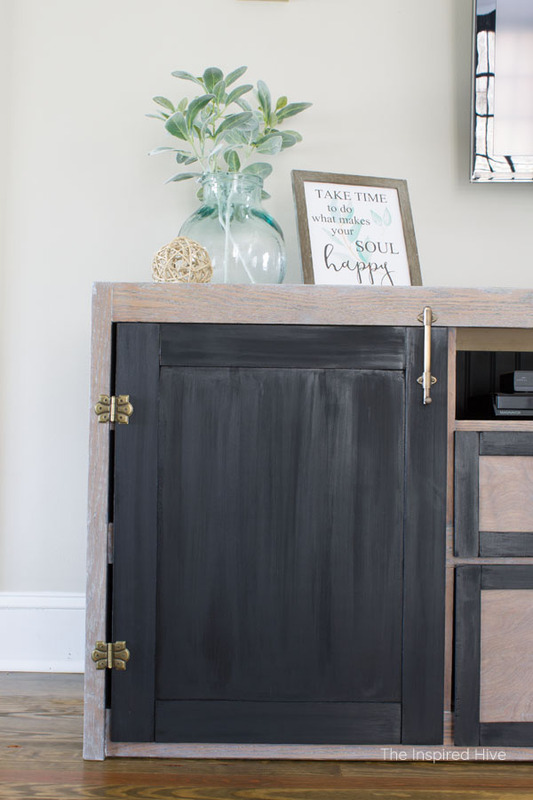 The weathered wood, the dark aged black, and the beautiful brushed gold are exactly what I crave throughout our entire home. And when I first bought this dresser years ago, I never knew that it would end up being the moodboard for our home. Or that I would design it from scratch and learn valuable lessons in DIYing. Or that it would bring a lot of old memories. And teach me that it's okay to make time for being creative when you have kids because creativity is what rejuvenates me. It turned out far from perfect, but it turned out perfectly beautiful for our family. I couldn't be more satisfied with this piece. The long journey was so worth it. And even when my decorating tastes inevitably change again someday, I'm not sure I'll ever be able to part with this old dresser. 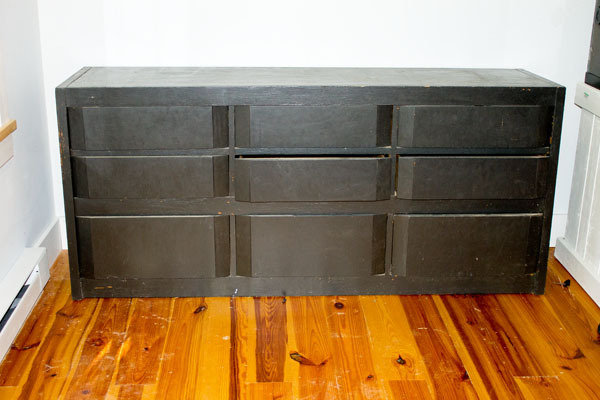 Remove all drawers, hardware, backing, staples, nails, screws, etc. 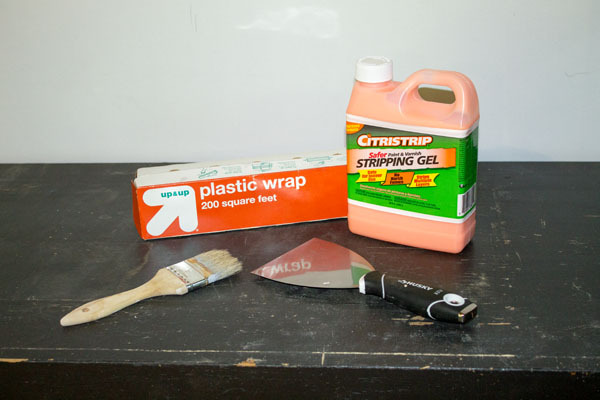 Strip the finish off of the dresser using Citri-strip and a paint scraper. Wipe with mineral spirits. Sand smooth. Dust off and wipe again with mineral spirits. Apply stain. Wipe off excess. Allow to dry. 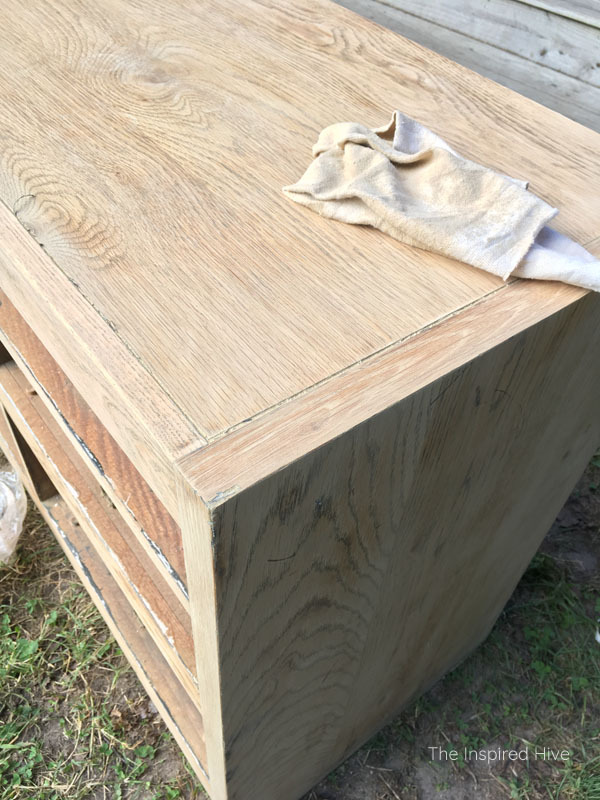 Apply liming wax to dresser against the grain. Wipe away excess using clear wax. Buff after 30 minutes. Measure and cut plywood for shelves, doors, drawer fronts, and trim. Measure and cut 1x2 support pieces. Sand rough edges. Attach 1x2 supports with a brad nailer. Places shelves on top of supports and attach with brad nailer. Paint shelves. Measure and cut beadboard. Cut out a whole in the center for cords. Paint the beadboard. Once dry, attach to the back of the dresser with brad nailer. 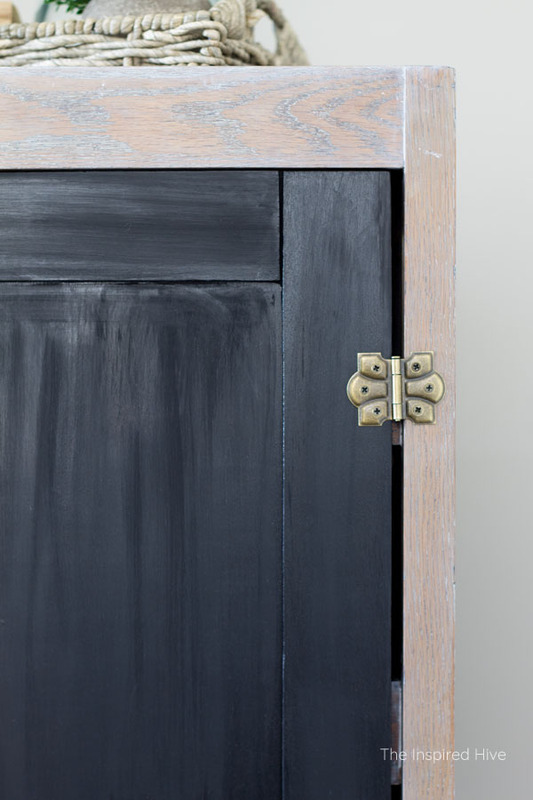 Attach trim pieces to cabinet doors using wood glue and clamps. 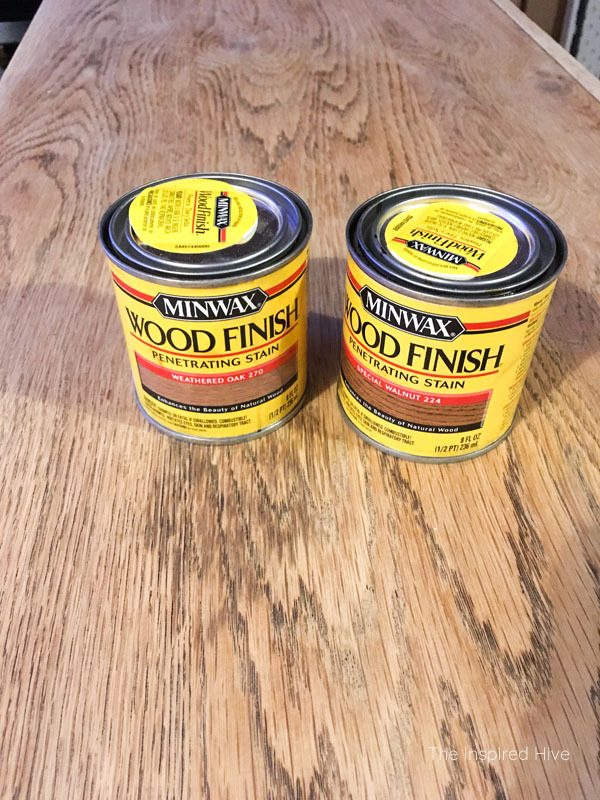 Once dry, apply two coats of paint. Allow to dry between coats. Stain drawer fronts. 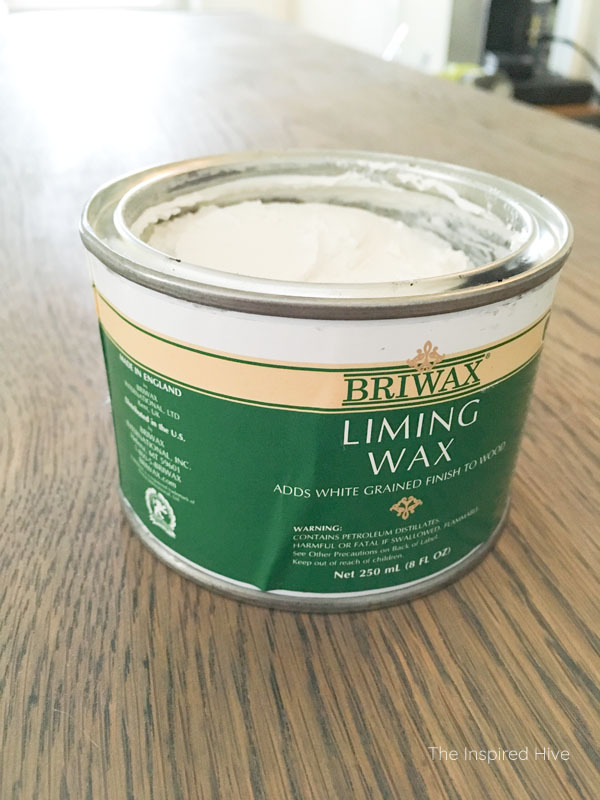 Once dry, apply liming wax. Wipe away excess using clear wax. Buff after 30 minutes. 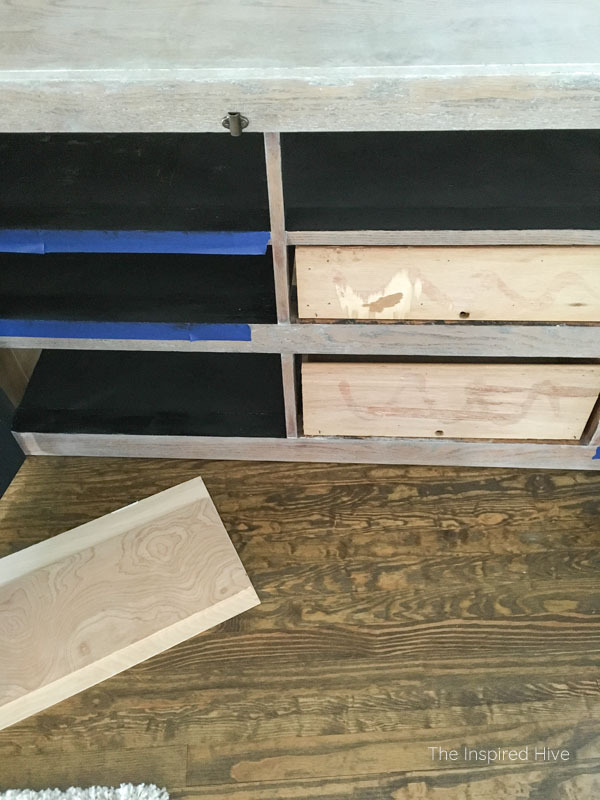 Paint black trim pieces for drawer fronts. Attach with wood glue and clamps. 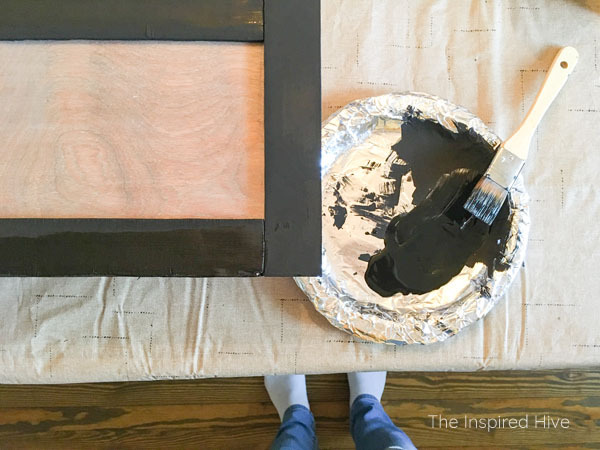 Apply glaze to all black painted pieces. Use a sponge brush to apply. Wipe away in long strokes down the entire length of the piece. Allow to dry. 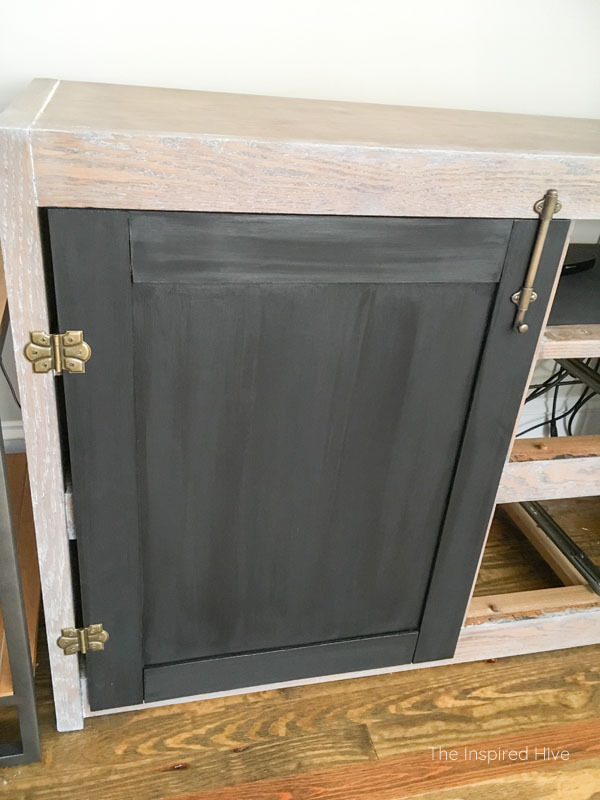 Attach hinges to doors and dresser. Attach surface bolt latches. 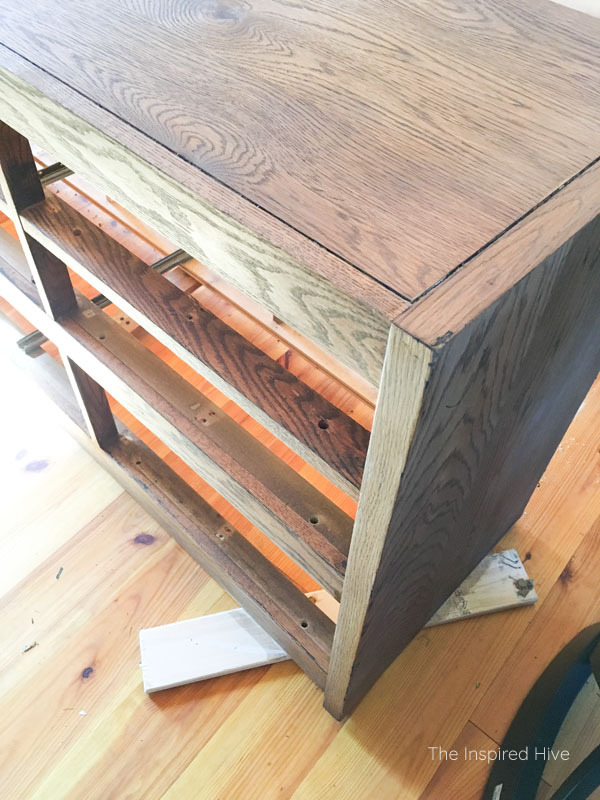 Attach drawer fronts to drawers using wood glue and clamps. Once dry, install drawer pulls.